Everything was in place. The cemetery was a sea of green grass, gray granite markers, tiny flags, and red geraniums. All we needed was a marching band, the Little League, the Girl Scouts, and the Color Guard and we'd be all set. And here they come, right on cue. No one comes from a more scenic hometown than I do and there is no day of the year when Shirley Center, Massachusetts looks more idyllic than on Memorial Day. This weekend, my eye lingered on all the mossy Civil War soldiers' graves (there are quite a few) and I thought about the marker in the center of the Common that honors the ones who didn't come back. 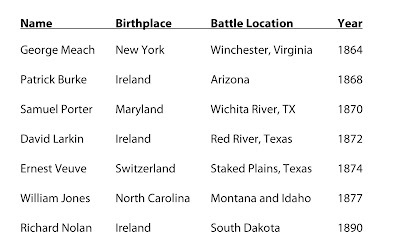 On Memorial Day, anyone who died fighting in any war should be in our thoughts, so I have some interesting names that I'd like to share. These men are listed with the US Congress as recipients of the Medal of Honor (sometimes called the Congressional Medal of Honor), given, usually, for gallantry in action. But they weren't gun-toting combat soldiers; they were hammer-hoisting horseshoers. Not airmen or artillerymen or scouts or Marines. They were sent with the cavalry to shoe the horses and they somehow ended up performing acts of courage and distinction. They perhaps performed these acts unarmed, except for their tools. George Meach actually captured the flag for the Union forces at the battle at Winchester; I wonder if he still had his apron on. 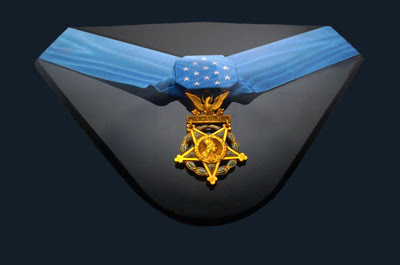 For many years, the Medal of Honor was the only medal given. It began after the Civil War; up until then, the Americans didn't give medals. Except for George, who was in the Civil War, these men were part of an army mounted on horseback that was sent to clear the western frontier and make it safe for the migration of thousands of settlers. The Native Americans stood in their way, and the conflict is as much a wound on the national conscience as the Civil War that preceded it. The Army depended on horses and needed farriers. Lots of them. Many immigrant farriers used their skill to get through Ellis Island's immigration red tape and enlisted right there in the army as a way to gain citizenship with guaranteed pay; others were quickly trained. Four of the farriers who won the Medal of Honor were immigrants. Many, like Ernst Veuve, shod horses in the Army without ever learning to speak English. I'm sure that, in later wars, there were farriers who were awarded many medals, while serving in combat. Some other farriers to remember today: Vincent Charley, John Bringes, James Moore, Benjamin Brandon, Benjamin Wells, and William Heath. Those six farriers set out for what was supposed to be a simple week-long maneuver under their general, one George Armstrong Custer. It ended in the valley of Montana's Little Big Horn river on June 25, 1876. I think you know the rest of that story. Memorial Day began in 1868, when it was called simply "remembrance day". Take a minute today and remember what and who this holiday is really about. Interesting take on the holiday, Dr. Fran. Very, very cool stuff for a history buff. Thanks! Very funny, Ted, you know I'm not a doctor. Unless it's a doctor of clamshells and seagull droppings. So glad you enjoyed the history, one more military story to come tonight and then it's back to contemporary hooves! It is 2013, Memorial Day is tomorrow and somehow I found your entry from the wonders of Google. Very interesting field of study and a history lesson I never thought of before. Thank you.